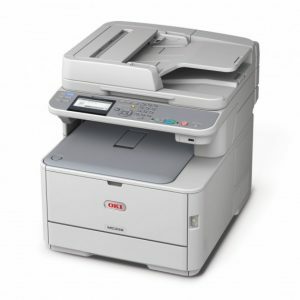 When it comes to A4 colour laser multifunction printers, Oki has three series – the MC300, the MC500, and the MC700. The Oki MC300 series is the entry-level series. 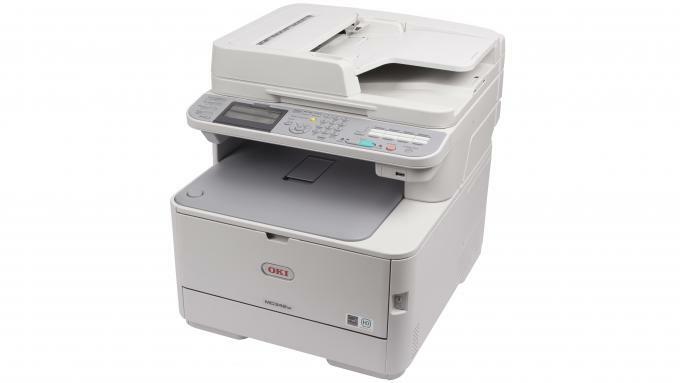 The Oki MC342DNW is lesser of the two models in this series, even though the differences are not stark. 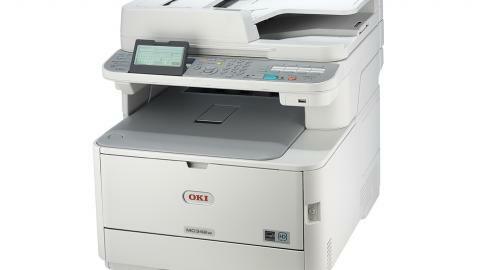 We’ve already reviewed the upper model – Oki MC363DNW – some time back. We’ll be reviewing the MC342DNW now. 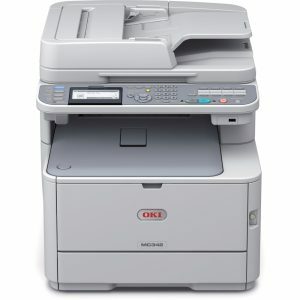 Like its bigger brother, the Oki MC342DNW is a multifunction printer which means it prints, copies, scans, and faxes. Furthermore, it is a LED-based printer. It uses Oki’s Digital 4 LED Full-colour Electrophotographic Printing Method. The device is still classified as a laser printer because the principles remain the same even with the use of LEDs in place of a laser. The Oki MC342DNW is versatile in the way that it can fit into Small Office / Home Office (SOHO) and Small to Medium Enterprise (SME) setups equally well. Its suitability for the SME setup, however, requires optional components. Here’s our review. What we liked the most about the Oki MC342DNW is its scalability. In this market, paper scalability has to be appreciated because it facilitates the growth of smaller businesses. For example, if you have a small or home business, wouldn’t you want devices with flexible capacities so that you don’t have to replace them when your business grows? The standard variant of the Oki MC342DNW comes with a capacity of 350 sheets divided between a 250-sheet primary tray and a 100-sheet multipurpose tray. This makes this device suitable for the SOHO set-up with average volume requirements. There is an option to take the paper capacity to 880 sheets with the addition of the optional 530-sheet tray. This will make this device suitable for SOHO setups with heavy-duty printing requirements or SME setups with low volume printing requirements. The Original Equipment Manufacturer (OEM) recommends printing 3,000 pages per month on this device but it does have the capacity to handle as many as 45,000 pages per month. In terms of paper handling, another plus point in favour of this device is that it has a straight paper path. This is fairly rare. This isn’t a functional benefit as such but it helps when your printed documents don’t curl the moment you let go. The device also boasts of a Reversing Automatic Document Feeder (RADF) which has a capacity of 50 sheets. The RADF is useful because it duplexes your documents automatically. Needless to say, this will reduce your paper costs significantly, if you have the time to use it a lot. It should be noted, however, that the RADF doesn’t support single-pass duplexing. In terms of print speed, the Oki MC342DNW fares well in comparison to its competitors. Its rated print speed is 22 pages per minute (ppm) for colour documents and 20 ppm for monochrome documents. Even the scanning speed is decent at 24 images per minute (ipm) for monochrome and 20 ipm for colour documents. While paper handling and speeds are good, a device needs to deliver on print quality first and foremost. The Oki MC342DNW mostly does well in this regard as well. It excels in text printing with characters looking clean even under the magnifying glass and at lower font sizes. Excellent text output is expected with laser devices, however. What came as a surprise is the output quality of graphics. It seems as if the device is liberal with its use of toner in the case of graphics printing because even solid bars and pies stood out. Where the device suffers in terms of output quality is images. Photo printing requires certain sophistication in the use of colours to ensure that the gradients are in control. This is where the Oki MC342DNW falls short. It is rated to print at a resolution of 600 x 600 dots per inch (dpi). Connectivity is also a strong point of the Oki MC342DNW. The OEM has provided three connectivity options in the form of USB 2.0, Ethernet, and wireless. However, the very latest options of Wi-Fi Direct and Near-Field Communication (NFC) have not been provided. Using either the Ethernet or wireless connectivity option will make this device mobile friendly and compatible with Google Cloud Print and Apple Air Print. The biggest problem with the Oki MC342DNW is cost. It is an expensive device, whichever way you choose to look at it. If you consider the acquisition cost, this device’s listed price is just short of $500 which is quite high. While you can get it for close to $300 by shopping around and availing discounts, the price is still steep. Considering running costs wouldn’t make you feel any better either. 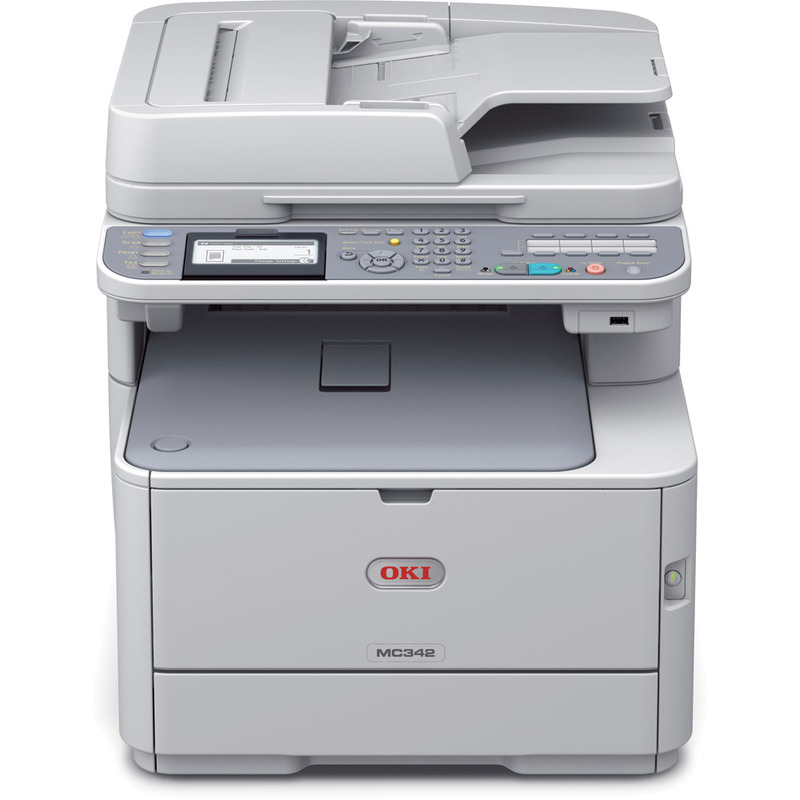 Unlike the more expensive printing devices out there that compensate for high acquisition costs by low running costs, the Oki MC342DNW is expensive to run as well. You can expect to pay around 26.87 cents for every page you print if you use cartridges manufactured by the OEM. You can reduce the damage a little by using aftermarket cartridges, however. Using generic or compatible cartridges will bring your per-page cost down to around 23.48 cents. Another problem with the Oki MC342DNW is its size, weight, and appearance. This multifunction printer is big and clunky. It measures about 427mm in width, 509mm in depth, and 444mm in height. Further, it weighs a very hefty 29 Kg. Its design is fairly traditional as well. All these elements combine to make this device very chunky in look and feel. There’s a flip side to this, though. All that weight partly comes from the quality of the Oki MC342DNW’s construction. The housing is heavy because it is strong and durable. This means that you can lean on this device without being worried about being swallowed by it. Inside the housing, the Oki MC342DNW uses a 533 MHz processor in conjunction with a 256MB RAM drive. You cannot upgrade the processor but if you want more speed you can take the RAM to 768MB. The entire Oki technology combines to deliver decent first-print-out times. If you’re printing a monochrome document, you expect to have it in your hand within 8.5 seconds. Colour documents, however, may take slightly longer with first-print-out times being clocked closer to 9 seconds. The control panel of the device is highlighted by an 84.1mm wide LCD blue backlit graphics display screen along with navigation buttons. There are also a series of buttons and an alphanumeric keypad. The buttons you’ll find on the control panel are for ‘Copy’, ‘Scan’, ‘Print’, ‘Mode’, ‘Setting’, ‘Clear’, ‘Stop’, ‘Power Save’, ‘Reset’, And ‘Help’. There’s even a front-facing USB port right under the control panel for easy access. The Oki MC342DNW with a 12-month onsite warranty. However, this can be extended to three years if the owner registers with the website.